“Elite, easy calving, readily identifiable, registered Hereford sires that leave highly saleable white faced progeny – the ideal dairy beef cross animal” is the essence of the NZ Hereford - Boehringer Ingelheim Merit Dairy Sire programme. Data provides consistent evidence that it is the resulting white face progeny from Hereford dairy beef breeding programmes that claim the highest premiums in the sale yards, ensuring additional revenue for the dairy farmer. NZ Hereford - Boehringer Ingelheim Merit Dairy Sires can be identified at registered Hereford Bull sales nationwide, by their certificates or by the recognizable Boehringer Ingelheim logo denotion in bull sales catalogue. Individual animal status' can be checked by using the Internet Solutions Animal enquiry service on the NZHA website. 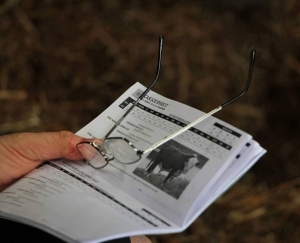 In 2018, over 160 registered Hereford yearling bulls have been identified using actual performance data and breeding values from the Breedplan Genetic Evaluation, in an analysis to select ‘low birthweight, ease of calving, optimum growth’ registered Hereford sires suitable for use within the dairy industry. These sires will serve the dairy farmer well in his quest to find ideal dairy beef bulls to use over heifers and cows following artificial insemination programmes. The easy temperament and the white face identification factor of the Hereford breed are value added management tools. An additional feature to the programme from 2013 onwards, is that all registered Hereford males meeting the Merit Dairy Sire criteria will be awarded ‘lifetime’ status, provided they meet the programme criteria on an annual basis. Simply put, aged bulls ie older than yearlings can now rightfully gain NZ Hereford - Boehringer Ingelheim Merit Dairy Sire status. Estimated Breeding Values (EBV’s) give the best estimate of an animal’s genetic worth for a particular trait (characteristic). Merit Sire selection criteria states that EBV’s for the two important Merit Dairy Sire traits must be a maximum of +1.9 kg for birthweight (in top 10% of the breed) and a minimum of +68kg (top 70% of the breed) for 600day growth respectively. Birthweight EBV’s accuracies are set at a minimum of 70% for the yearling bull and 75% for his sire and dam respectively. Sire and dam birthweight EBV’s are set at a maximum of +3kg EBV. This measure ensures Merit bulls come from low birthweight breeding lines. Merit Dairy Sire EBV’s compare favourably to the Hereford breed EBV averages, currently at +4.3kg for birthweight. In 2018, all animals must be in the top 20% of the dairy maternal selection at +$126 minimum. 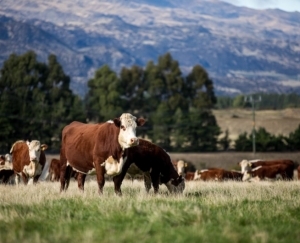 A Boehringer Ingelheim NZ sponsored NZ Hereford scheme; the Merit Dairy Sire programme is a tool to assist dairy farmers in their bull selection. It does not however, reduce the importance of visually appraising an ideal sire. Structural soundness and smooth shoulder contours will both obviously aid breeding ability and calving ease respectively. The certification of Hereford Merit Dairy Sires guarantees the dairy farmer a purebred registered high accuracy/ low birthweight Hereford – not a “Joe average, anonymous one”. As one dairy farmer using Hereford Merit Dairy Sires commented, “you can sell a calf with pride when it comes from a registered Hereford bull”.